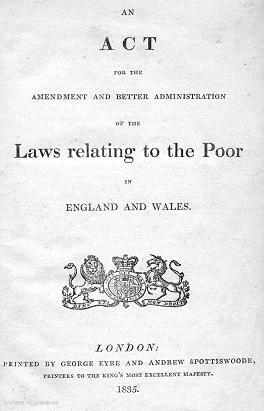 The Poor Law Amendment Act of 1834 — An Act for the Amendment and better Administration of the Laws relating to the Poor in England and Wales is one of the most significant pieces of social legislation in British history. At a stroke, it swept away an accumulation of poor-laws going back half a millennium, and replaced them with a national system for dealing with poverty and its relief based around the Union workhouse. To read the full text of the 1834 Act, just click on the picture of the title page alongside.